Hungarian dermatologist; born at Halas April 1, 1857; educated at Budapest. He was appointed assistant to Prof. Kaposi at Vienna in 1881, and was assistant at the Rukós Hospital, Budapest, from 1882 to 1885. In the following year he with several associates founded a public dispensary for the sick, reserving for himself the section for syphilitic diseases. He then traveled through Europe, studying at the principal clinics, and in 1889 was appointed lecturer and in 1893 departmental physician at the city hospital of Budapest, being made professor six years later. 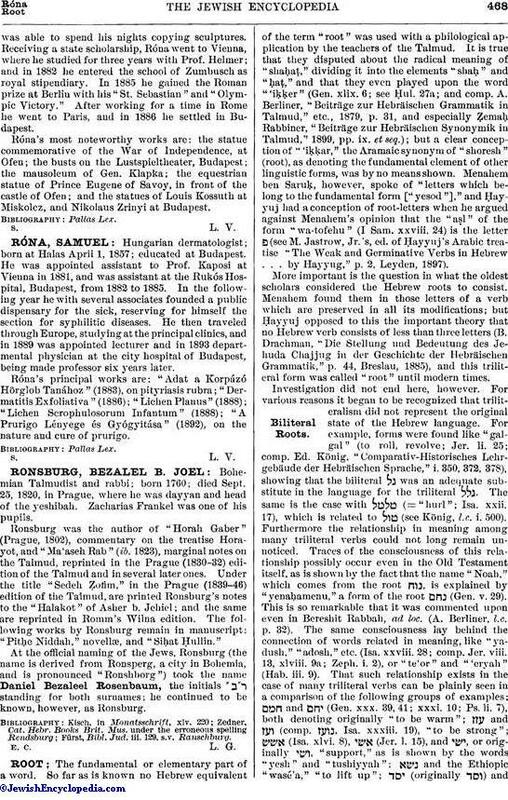 Róna's principal works are: "Adat a Korpázó Hörglob Tanához" (1883), on pityriasis rubra; "Dermatitis Exfoliativa" (1886); "Lichen Planus" (1888); "Lichen Scrophulosorum Infantum" (1888); "A Prurigo Lényege és Gyógyitása" (1892), on the nature and cure of prurigo.